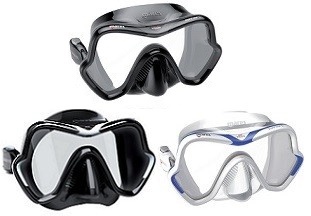 The Mares One Vision Mask is one of Mares newest members to the mask family. It is made with 100% silicone to keep the skirt sitting softly and comfortably on your face and has a single tempered glass lens to give you maximum vision. The slightly frosted skirt allows you to had perhiperal vision yet prevent the suns harsh rays from peaking in to the side of the mask. With easy adjustable side clips and a large silicone band, this mask is going to take the market by storm. A cool feature to the One Vision is the flexible silicone side mounts that hold the clip in place, this means that the is less chance of the mask moving when you adjust the strap. Available in 3 great colors.